Find information about UC San Diego's laboratory PPE Distribution Program. UC San Diego has a department funded PPE Distribution Program to provide labs with minimum personal protective equipment (PPE). Each eligible lab member will receive two lab coats and two pairs of safety glasses for the duration of their time at UCSD. Other types of PPE such as face shields, chemical splash goggles, fire resistant aprons, etc. are available for labs by special request. Location: 101 Marshall College (located in the portable trailer). Hours: Monday – Friday, 10 a.m. to 3 p.m.
Any researcher employed by UC San Diego (i.e. paid undergrads, grad students, post-docs, and staff) that will be working in the lab for at least one year. Volunteers will receive a loaner lab coat, which is a temporary use coat they will return to the PPE Office when are finished working in the lab. Important: Please have yourself added to your PI's Personnel List in the LHAT (Laboratory Hazard Assessment Tool) on the My Research Safety web page to participate in the PPE Distribution Program. If you are a volunteer, visiting scholar, or any other affiliate without a UCSD business systems account (Single Sign-On), you must complete steps 1 and 2 below in order to meet UCSD's training requirements. To register, contact your Department Security Administrator. Use DSA Search to lookup your DSA by UCSD email address (use the address of a current lab member). For people who are not eligible for this program, PPE can be purchased on Marketplace or in the Campus Bookstore. Adhere to the PPE standard identified in the Laboratory Hazard Assessment process. Assigned to an individual on My Research Safety. See Personal Protective Equipment - Requirements: Research Employees to learn how to use the Laboratory Hazard Assessment Tool (LHAT) on My Research Safety. The Loaner program provides a lab coat to any individual who does not have a personally fitted coat. This includes individuals who are waiting for their embroidered lab coats to be delivered or volunteers. Each member of a lab must be personally fitted for a lab coat and safety glasses. UCSD is currently offering several Types of Personal Protective Equipment (PDF). All faculty, students, staff, and visitors must wear proper personal protective equipment (PPE) when in the laboratories. In addition to the use of exposure control equipment, such as fume hoods, and following safe work practices, the correct selection and use of PPE is an essential element of safe work in the laboratory. Each Principal Investigator is responsible for the proper selection and use of PPE in the laboratory. To determine the required PPE, complete the laboratory hazard assessment tool (LHAT), under My Research Safety, to document the potential hazards present and the associated level of PPE required. Read the "Eligibility for the PPE Distribution Program" section above to make sure you are eligible to participate in this program. Please have your PI/Lab Manager/Safety Coordinator add you to your Principal Investigator's personnel List in the LHAT (Laboratory Hazard Assessment Tool) on the My Research Safety web page prior to being fitted for lab coats and safety glasses. Once you have been added to the personnel list, please stop by the PPE office at your convenience where we can fit you for lab coats and safety glasses.We are located at the 101 Marshall College building (find it on UCSD's MapLink), blue trailer west of Geisel Library, Monday through Friday, 10 a.m. — 3 p.m.
Embroidery must be your professional name, first name, and last name. If you have an M.D. and/or Ph.D., you may choose to include it at the end of your name, or put Dr. in front of your name. You may list other certifications after your name as long as it does not exceed 25 characters. Each member of a lab is required to be fitted for a lab coat and safety glasses. Prescription Eyewear purchases will not be covered by EH&S. Your department is responsible for the purchase of prescription safety glasses. Obtain a copy of your current eye prescription from your Ophthalmologist/Optometrist. Description: This package contains all items listed in the Basic Package above and the following additional items: Any frame from the Hoya Safety frame collection. This included Stainless Steel and Titanium frame options. Once you complete the irequest and it is approved, you will receive a PO number. For “Sunglass Option” select Yes / No. For 'Company Name'enter an abbreviation of the department you are assigned to. For 'Company Account Number with Distributor' enter the PO number assigned from the irequest. Select 'View Form' and print a copy of the form to take with you to your appointment with a Hoya provider. Next, click on the link on the left toolbar 'To locate a Hoya Network Eyecare Professional in your area'. Once you have selected a provider, call and schedule an appointment to be fitted for safety glasses. If you are experiencing issues, please contact the PPE Office at 858-534-2698 or ehs-ppe@ucsd.edu and someone will be able to assist you. Be listed on your PI's Personnel List in UCSD's LHAT application. Participating labs receive pre-printed or pre-labeled envelopes. Use these envelopes to mail soiled lab coats to the laundry service via Campus Mail Services. Important: If a coat is potentially contaminated with hazardous material, DO NOT send it in for laundering. Contact the EH&S PPE team at ehs-ppe@ucsd.edu for instructions. All lab coats must be decontaminated prior to laundry. Get a pre-labeled laundry envelope from your Lab Manager or Area Safety Coordinator. Empty pockets, fold and put your dry lab coat in the envelope. Seal it. Send only 1 lab coat per envelope. Do not put a wet coat in the envelope! Place the sealed envelope in any Campus Mail out-box or in a lab coat laundry mailbox (see locations below). Your laundered lab coat will be delivered back to your lab within 2 weeks. Use the online Lab Coat Envelope Request form. Note: Lab coats must be laundered by a laundry service that adheres to Title 8, Section 5193 of the California Code of Regulations. Do not take them home! Questions about delivery or laundering of your lab coat? Contact the EH&S PPE team at ehs-ppe@ucsd.edu. Coats sent for laundering must be in properly labeled envelopes (read the "Lab coat laundry process" section above for how to get your coat cleaned), and can be placed in any Campus Mail out-basket or out-box. Items from these boxes are picked up twice a week on Mondays and Wednesdays. Embroidered lab coats will take approximately 5-6 weeks to be delivered. Undelivered Coats: If you have not received your new lab coats within the time frames given please submit this form. Missing Coats: If you submitted your coat into our campus laundry system and it has been over 2 weeks since your submission, please contact the PPE Office at ehs-ppe@ucsd.edu. Contact the EH&S PPE team at ehs-ppe@ucsd.edu to arrange tailoring service if you need to have your lab coats altered. My Principal Investigator has general use lab coats available in the lab. Can I just wear one of those? Due to Cal/OSHA Title 8 regulations Section 3380, no coat should be used in the lab as a "general use" lab coat. Each member of a lab must be personally fitted for a lab coat and safety glasses. Additionally, coat standards have become more rigorous. 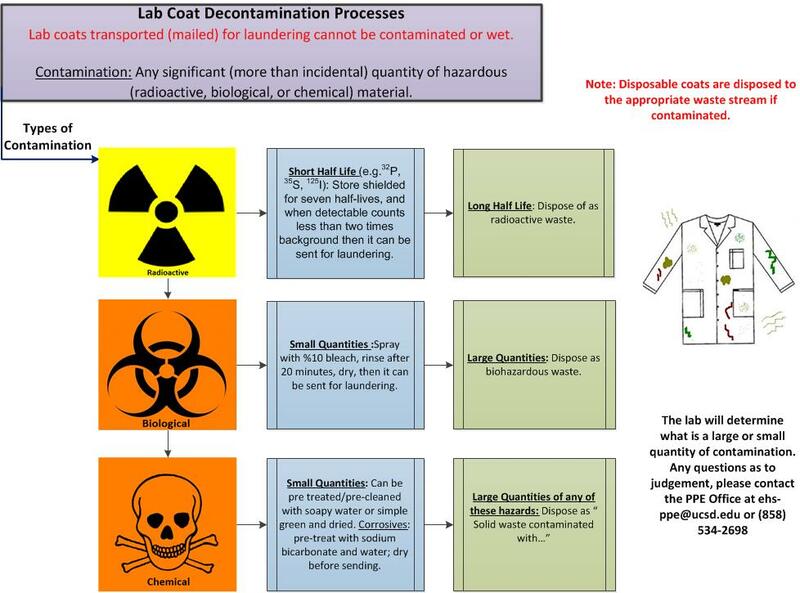 Please review the Lab Coat Guide to determine the coats you will need to use in your lab. All lab coats have an expiration date of 3-5 years depending on their use and condition. If your lab coat has any holes, please discard it or contact ehs-ppe@ucsd.edu or 858-534-2698 for recycling. What should I do when an individual is no longer working in the lab and has left their embroidered lab coat behind? If an individual will no longer be participating in the lab they have the option to keep their personalized coats or donate the coats to the PPE office, where the coats will be redistributed through the Loaner program. Due to Cal/OSHA Title 8 regulations, Section 3380, no coat should be used in the lab as a "general use" lab coat. Each member of a lab must be personally fitted for a lab coat and safety glasses. Does the PPE program offer UV protective Safety Eyewear? The PPE office carries safety glasses and goggles that offer eye protection against UV rays. If you require UV eye protection, please stop by the PPE office at your convenience so that you are properly fitted for eyewear. Will I be contacted when my embroidered lab coats will be delivered to the lab? You will not receive notice when the lab coats are being delivered. If they are not delivered within 6-8 weeks of the date the order was placed then you should contact the PPE Team at ehs-ppe@ucsd.edu or 858-534-2698, so that we may follow up with the vendor regarding your order. Can I send a non-UCSD lab coat into campus laundry? Yes. As long as you are assigned to a Principal Investigator in the HCP application, a non-UCSD lab coat can be cleaned through our campus laundry program. What should I do if it has been over two weeks since I sent my lab coat into campus laundry and have not received it back? If you submitted a dirty lab coat into campus laundry and have not received it back from campus laundry, please contact the PPE Office at ehs-ppe@ucsd.edu so that we can follow up with our laundry contact regarding the status of your coat in the laundry process. Will I receive a UCSD loaner lab coat back if I submit it into campus laundry? Each UCSD loaner lab coat that is submitted into campus will be cleaned and returned to the PPE Office for redistribution. If you submit a loaner coat into campus laundry and still require one, please report to the PPE office so that we can provide you with a clean coat. If I break/scratch/lose my safety glasses can I pick up another pair from the PPE Office? The PPE Office will provide a researcher with one replacement pair of glasses. If you have already received a replacement pair through our office then it is the responsibility of your assigned lab to purchase you a new pair. Questions? Contact the EH&S PPE team at ehs-ppe@ucsd.edu or (858) 534-2698.